Microfluidics is a recently introduced field of research area in which scientists study the behavior, precise control, and manipulation of fluids that are geometrically constrained to a small, typically sub-millimeter scale, where the dominant phenomena include diffusion, laminar flow, surface tension, and evaporation. By incorporating these new tools, researchers are able to create novel functions and methods. Emerging application areas for this technology include micro total analysis system (μTAS), tissue engineering, and drug screening. One of the major benefits of this technology is its ability to make an economical device that requires very small sample and small quantities of expensive reagent. It may also be possible to integrate more components in a device at higher resolution with this technology. 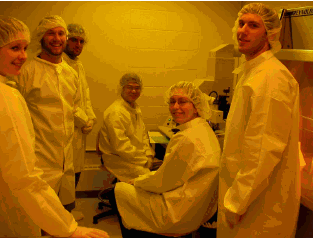 The Brandeis Materials Science Research and Enginering Center offers a one-week summer course from June 27 – July 1, 2011, “Introduction to Microfludics Technology“. The course will introduce students to the microfabrication technologies available to build microfluidic devices. This course has been created in response to the great interest from industry, government and academia in the field of microfluidics. We will build several microfluidic devices to understand the microscale phenomena and their applications. Throughout the course, we will place an emphasis on hands-on experimentation with microfluidic systems where laminar flow, surface tension, and molecular diffusion dominate. The instructor, Dr. Dongshin Kim, received his Ph.D. (2006) degree in Mechanical Engineering, MS degrees in both Biomedical (2004) and Mechanical (2001) Engineering from the University of Wisconsin-Madison. After his Ph.D. program, Dr. Kim received biological training on tissue engineering in the Department of Animal Sciences at the University of Illinois as a postdoctoral associate in 2006. In January of 2009, Dr. Kim joined the Materials Research Science and Engineering Center (MRSEC) at Brandeis University. Since then, Dr. Kim has been collaborating with many faculty members and scientists in the field of life science to implement the microfluidics technology into their researches.